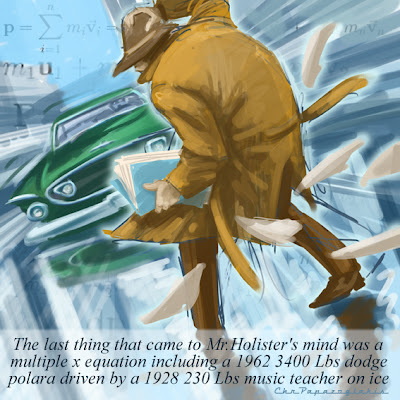 failing to determine the sliding coefficient of the ice killed Mister Holister, physic professor. I wanted to do some tribute to my never ending fascination for americana and its imagery, but it didn't turn out too good. too many things on my mind to do anything decent today. I'm officially hunting for a new house while still caughing on the dust and chips of the work in my present house. this includes some long term decisions and financial / way of life / enslavement issues that just paralyze my mind. my apologies and thank you for your kind help. i think it is wonderful, full of action. good luck! but this is good. very dynamic. I like the perspective, too.